Ha, wait a few years, it gets harder. How about that sun shining finally! Have we burnt the last fire wood yet? It is true! Such joy! Love his shirt! I think my sister and I could have used those Thing t-shirts in our early years. We were not twins, but only a year and a half apart and people always asked my mom if we were twins... I think she dressed us alike often, sewing most of our clothes. So, Thing 1 and Thing 2 shirts would have been highly appropriate. Have a great week-end, Lisa! Enjoy the weather. Looks like a marathon runner to me! He's got his form down pat - cute photo! Well, he does have an excellent example of a good runner! He will run well like as you! He probably will be a runner. He looks like he's totally absorbed in the moment. Looks like a natural athlete! You have a mini-me!! We drove behind an SUV yesterday with loads of stickers on the back about running, it made me think of you. When I mentioned it to Phil, he quoted your blog name with no prompting! Guess I had talked about you more than I thought. I am still hoping we can meet. I wish I enjoyed running...but for me it is cycling. Kids have so much energy... and they know how to have fun! Ha! That is sweet. And look at all that green everywhere, niiiiice!! I love to see kids outside running and playing. So many kids these days don't get any exercise much --since they are on their little phones/gadgets so much!!!!! You are raising a WINNER. He's a natural like his mama! Great pic! Awesome form. He looks like he is into the moment and nothing can distract him. He really does look like he's got some form there! He does have good form and the look of happy concentration. Yep. He's your son alright. Hahahaha... look at him go. He is a mini you! 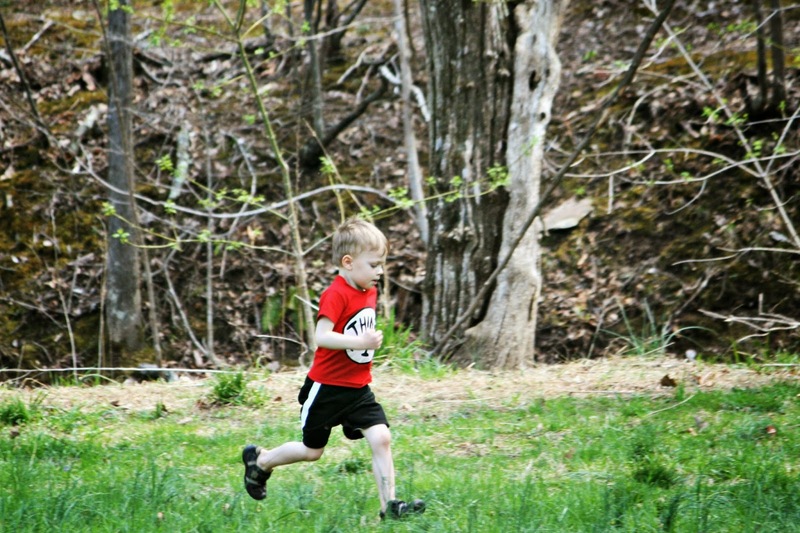 Funny, my older son's running form is awful, but my young daughter's form is great. Same family, both good athletes, but obviously lots of differences. I love to see children playing outdoors, and having exercise. not at computers all the time. Reid is a gorgeous child. How is Francie, your horse? He looks cute! I think you have yourself a runner right there. Mica loves to run. Isaak doesn't mind, but he's much slower.